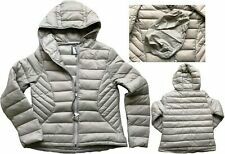 Gorgeous grey Ladies michael Kors Down Fill Coat Size XL 16 . Condition is Used but excellent condition. Ok it’s probably a winter coat as it’s lined with a packable down fill but you can grab a bargain for the winter :) I didn’t wear it much but it did me proud with warmth on a trip to Lapland last year. It is long line. It feels great to wear something as quality as this was originally into hundreds of pounds. Machine washable and tumble dry friendly too! Navy Canada Goose Trillium Parka / Coat in size S up for sale. It has been used for three winter seasons and is still in good condition. Besides that, the parka still has a good amount of Down Fill and Coyote Fur. Front side LENGTH from shoulder: 92cm / 36in. Sleeve length from shoulder: 49cm / 19in. catalog number:MIX-. 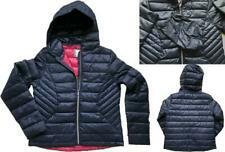 This coat is good quality, it is very stylish, warm and soft. The 3/4 sleeve style made this coat different compare to normal winter coat. UNIQLO SIZE UK 4-6 XS WOMENS BROWN/KHAKI DOWN COAT JACKET . Condition is Used. Dispatched with eBay delivery – Shutl 1 day. Colour Black. Nape of neck to bottom 58 cm. Arm pit to cuff 40 cm. THE NORTH FACE TREVAIL PARKA. Insulation: Goose Down (800 cuin). Screen print logos. Front length (without collar): 77 cm / 30.3 in. Underarm sleeve length (from armpit): 50 cm / 19.7 in. Two way centre front zip. 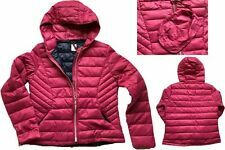 What we particularly like about this coat is how it has managed to combine the warmth of a Puffer Coat with its a feminine shape. This is achieved courtesy of the simple waist adjusters which are perfectly positioned. (Made from - 65% Polyester 19% Cotton 16% Nylon; Body Lining: 100% Polyester; Fur Trim: 76% Acrylic 20% Polyester 4% Modacrylic; Padding: 50% Down 50% Feather. Size - UK 8 US 4. b) Length: 23.2" | 59 cm. Condition is Used. Deep olive green. Condition i s ex ce ll en t us ed. D ou bl e zi p an d do ub le b ut to ns t o front. B ut to n do wn w ir ed p oc ke ts. R em oveable P Uf fe r ja ck et l in in g. Zi p to u nd er ar ms ! Probably due to wear the actual sizes may be slightly different from the manufacturer size. E Shoulder Width 18.9. C Sleeve Length 22.8. D Full Length 33.5 85. B Collar to End of Sleeve 31.5. Condition Excellent used condition. Fur edged Hood Black. 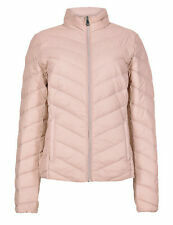 Per Una Lovely Warm Feather And Down Jacket Size L (not a big Large more a size 14 (14). ). Pit to pit: 23". Length: 24". The length of upperwear is from the nape of the neck to the bottom of the hem. 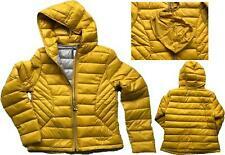 THE NORTH FACE TREVAIL JACKET. Sweater-weight, 800 fill down jacket is the perfect mid-layer for backcountry missions. Internal chest pocket. Insulation: Goose Down (800 cuin). Front zipper length: 64 cm / 25.2 in.